In harmony with the rebirth of nature, the Iranian New Year Celebration, or NORUZ (NowRuz), always begins on the first day of spring. Nowruz ceremonies are symbolic representations of two ancient concepts - the End and the Rebirth; or Good and Evil. A few weeks before the New Year, Iranians clean and rearrange their homes. They make new clothes, bake pastries and germinate seeds as sign of renewal. The ceremonial cloth is set up in each household. Troubadours, referred to as Haji Firuz, disguise themselves with makeup and wear brightly colored outfits of satin. These Haji Firuz, singing and dancing, parade as a carnival through the streets with tambourines, kettle drums, and trumpets to spread good cheer and the news of the coming new year. The origins of NoRuz are unknown, but they go back several thousand years predating the Achaemenian Dynasty. The ancient Iranians had a festival called "Farvardgan" which lasted ten days, and took place at the end of the solar year. It appears that this was a festival of sorrow and mourning, signifying the end of life while the festival of NoRuz, at the beginning of spring signified rebirth, and was a time of great joy and celebration. Give me your beautiful red color And take back my sickly pallor! The other ancient symbolic representation of NoRuz is based around the idea of the triumph of good over evil. According to the Shah-nameh (The Book of Kings), the national Iranian epic by Ferdowsi, NoRuz came into being during the reign of the mythical King Jamshid; when he defeated the evil demons (divs) seizing their treasures, becoming master of everything but the heavens and bringing prosperity to his people. To reach the heavens, Jamshid ordered a throne to be built with the jewels he had captured. He then sat on the throne and commanded the demons to lift him up into the sky. When the sun's rays hit the throne, the sky was illuminated with a multitude of colours. The people were amazed at the King's power and they showered him with even more jewels and treasures. 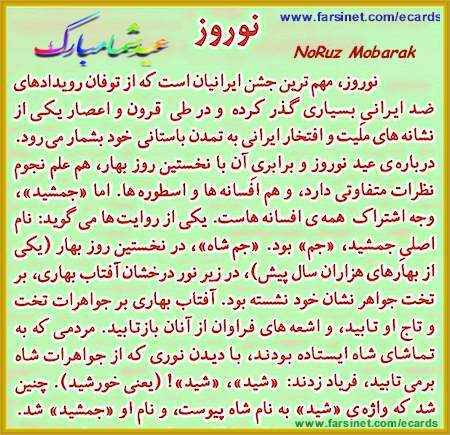 This day of great celebration was named NoRuz, and was recognised as the first day of the year. A ceremonial table called Sofreh-e Haft Seen (cloth of seven dishes), name of each dish beginning with the Persian letter Sinn. Sizdeh Thirteen and Sizdeh Bedar is the process of getting over with or passing over the thirteenth day of the New Year. Lisa jun, I am having hard enough time with my pre-kindergarten.